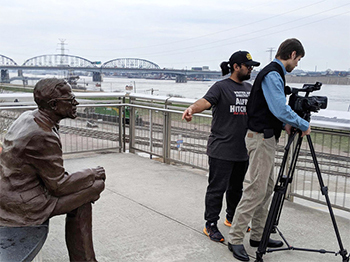 Southern Illinois University Edwardsville’s value of citizenship is in action throughout East St. Louis as residents are motivated to engage in their community’s rich history and actively contribute to its future growth. The high impact community engagement practice is supported by the CAS Targeted Funding Initiative (TFI). The TFI was launched in 2015 by CAS Dean Greg Budzban, PhD, and utilizes funding acquired through the College’s Winter Session courses and other CAS internal funds. To date, it has provided more than $700,000 to faculty and staff. The #89BlocksStrong campaign has many components, from research to media and creative implementation. 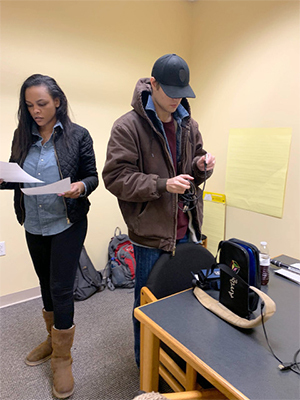 Students are conducting focus groups and developing surveys to better understand residents’ motivations to participate in community organizations and meetings, as well as their perceptions of East St. Louis. Students are also designing a website, visual content for various social media platforms and promotional merchandising, and are working on media plan to construct and maintain the campaign’s social media channels. According to Mishra, the project not only promotes involvement among community members, but also encourages students to be civic-minded. Mishra emphasizes the value of University and community collaborations, as they build partnerships, and create opportunities for faculty and students to apply academic knowledge, gain skills and have field experiences. Importantly, they have an impact in the region and make a positive difference in the lives of many. 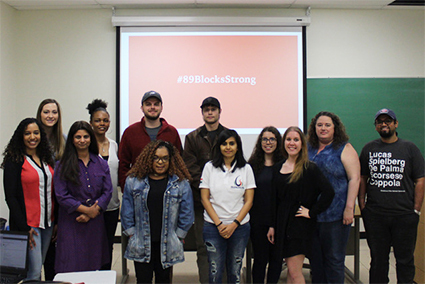 Photos: Media campaigns students creating the #89BlocksStrong campaign stand alongside community organizer Jessica Wernli (front far left) and Dr. Suman Mishra (front second from left).